– SING YOUR SONG – DROP YOUR RHYMES – TELL YOUR JOKES – READ YOUR POEMS – PERFORM YOUR ART – MAKE SOME NOISE – KICK YOUR BEATS – SPREAD YOUR JOY – TELL YOUR STORY – TWERK YO BUTTS – PLAY YOUR INSTRUMENTS – STAND UP ROUTINE ANYONE? – SHARE YOUR EXPERIENCES – FUN TIMES – LET’S DO THIS! – WE ARE ALL IN THIS TOGEHTHA! Everybody’s welcome! We want to reach the highest level of variety and diversity possible. It’s like THE INTERNET but without the youtube comments. Share whatever musical or performative creation you wanna share in front of an audience. Do whatever the f*** you want and come get your 10 minutes of fame. We wanna built a platform that helps people like YOU (yeah, you!) express themselves in a non-judgemental and supportive environment! Sign up starts at 7.30 p.m. Evening starts at 8.00. Draw a number and you’re ready to go. Bring your instruments and props. First come, first serve. COMPANY RULES: NO JUDGEMENT; NO COMPETITION; NO INJURIES! Wanna be a Wildcard act? Wanna promote your band? Wanna show us some more? The WILDCARD gets a full 20 minutes of stage time. Ask for a wildcard signup with a facebook private message 2 weeks prior to the OPEN MIC VIENNA of your desired date. 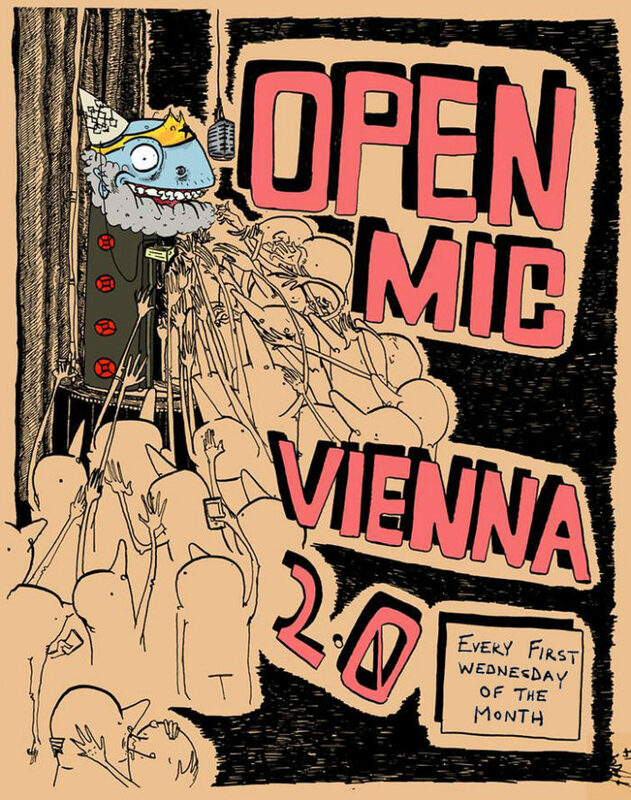 The wildcard will be drawn by numbers in a viral video one week before the actual OPEN MIC VIENNA night. This whole thing is promoted in English, not because we refuse to honour the Austrian language. No no no, all we wanna do is to give everybody a chance to understand this shiat. It’s a little bit of a hippie thingy, you guys.